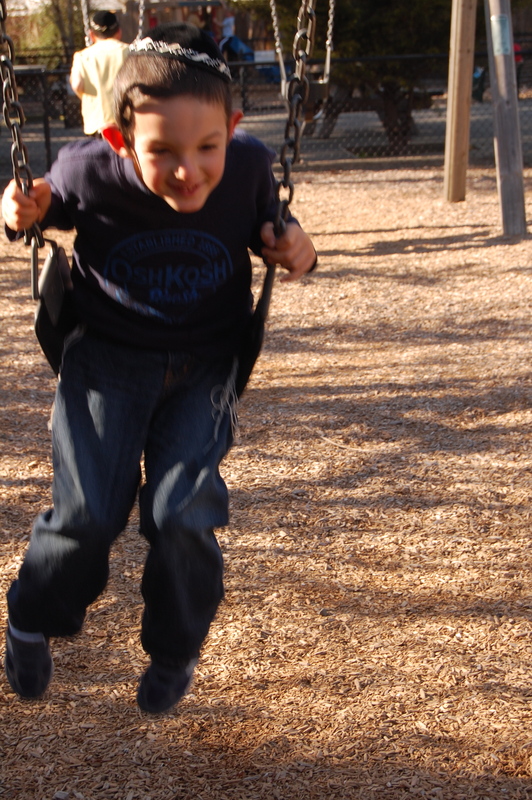 Chaim Boruch went on a big swing all by himself for the first time ever! What a thrilling moment to see in your child’s eyes glitter and shine of triumph and victory. He felt so big and I felt so proud. The wind blew in his face. It was just one of those moments in time when pushing your child on a swing is the most meaningful and exhilerating event ever! I remember going on a swing in my childhood years. I would race to the swings during recess and pump my legs as fast as I could, with rhythm and strength until I could not reach any higher. I would almost touch the branches of the huge oak trees above me and wonder if one day I really would. I think in hindsight, that is where I could see that the sky really is the limit. The swing began to slow down. Until there was only a whisper of movement, ever so slight. I picked up Chaim Boruch from his swing, with a happy full heart. He realized that the swing he was sitting on was attached from above with unbreakable thick metal chain. His look of wonder was brilliant. Profound. Deep. Deep with new found understanding of how his ‘swing’ worked. There I stood, with gratitude to my child. On this sunny day…he taught me again about life. To always know we are connected above. Hashem (G-d) is holding us secure and strong. Baruch H'Shem for bringing you to us. Your family are an inspiration to me. Each and every one of you. And your tenth year anniversary celebration was awesome. Thank you.